Tips to turn a bad day around! when I seem to be having one of those days – take note! beautiful vibrant rainbow, is another gratifying “ooh, aah!” moment. Finally, don’t forget the essentials! Candles, music and a face mask are a must have. an anti-anxiety agent, therefore ensuring a great night’s sleep! night’s sleep (this can make all the difference between a good and bad day!). relaxing!). Having a clean bedroom honestly makes all the difference! cleaned bed sheets! It is simply heavenly. candles, plump pillows, fresh flowers and your favourite blanket to keep you warm. you feel like a million bucks! 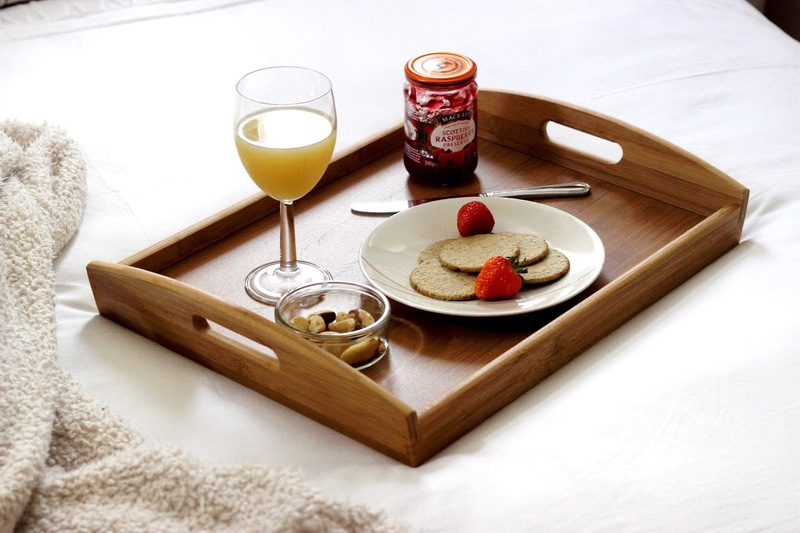 Top off your pamper day with a lavish snacks tray in bed while you catch up on your favourite TV series! blog post hoping that it could be helpful to someone else! What did you think of today’s post? What are your favourite way’s to unwind when you’re having a low day? your photography is to die for. i like to go on a walk, just to get outside of the house whenever i have a bad day. Thank you hun! And I agree, a simple walk can be so relaxing! Great, very complete advice! I have something a little bit similar coming on my blog tomorrow night! Honestly, these are all such great tips. I've been having pretty bad days recently and have been trying to cope by sleeping in in my bedroom, but it hasn't been sufficient, I find. Perhaps it's the bed linen. Or maybe I'm missing a face mask. Either way, all great tips. a cor do batom na primeira imagem é estupendo! Chamomile tea is the best thing in the world!!! Loving these! I could definitely use one of those tips on this rainy day/week! Great tips and what lovely photos. I always love taking a bath when I need a bit of me time and a cheer up. Creating a calm and comforting environment is also so important. There is nothing like winding down in your room with a tea and fairy lights after a nice bath with some relaxing music. Nice and cute post dear!! These are all amazing suggestions! There is nothing better than just have a little 'me' time. It does wonders for your head and gives you a wonderful calm environment! Great post my darling and beautiful photography! Great post & totally agree with everything!